Male Spotted Wing Drosophila; photo by Griffin Dill. Actual size: 2-3 mm. We have found numerous spotted wing drosophila (SWD) fruit flies in raspberry and highbush blueberry plantings in Maine over the past week, in nearly every location that we have set up traps (see table below). This information compliments reports from throughout the northeast that SWD is active and in higher numbers much earlier than we have seen in recent years. 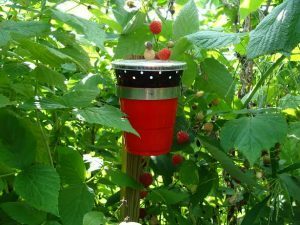 Some of the fly counts are already well above what we would consider potentially damaging to ripening berry crops, especially raspberries and blueberries. 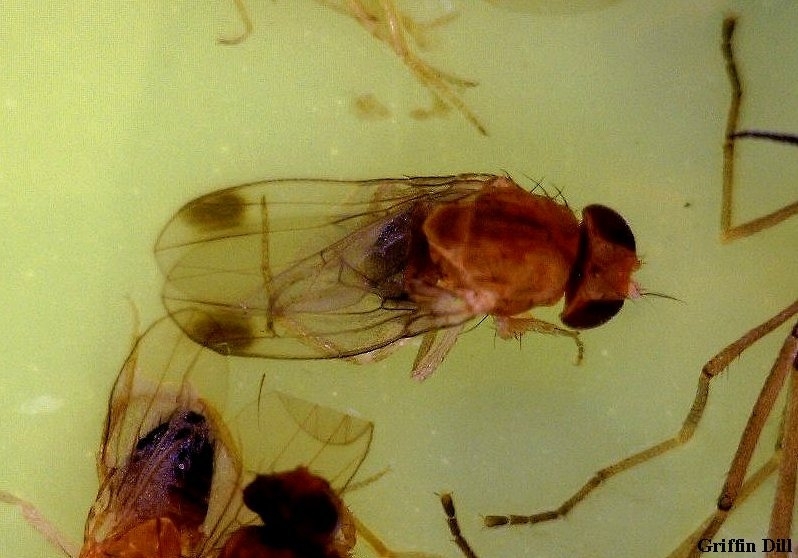 Research in Maine and other regions suggests that when 6 to 10 flies are caught in a yeast-baited trap in a week, larvae will start appearing in the fruit. Based on what we know so far about this pest, here are six rules for managing spotted wing drosophila. Spray regularly and often once flies have been found in the field (1-2/week). Chill all fruit immediately after harvest to 38ºF (or as close as you can) for at least 12 hours to slow development of any eggs or larvae. Prune the planting to open up the canopy and create dry, light conditions. Products that provide good control of drosophila on berry crops include spinosad (Radiant® for strawberries, Delegate® for raspberries and blueberries), Asana®, Brigade®, Danitol®, malathion, Exirel® (blueberries only) and Assail®. Research suggests that adding table sugar to group 4A insecticides, such as Assail®, may improve their effectiveness. The recommended rate would be 1-2 lbs. sugar per 100 gallons of spray. Please check product labels for rates, post-harvest intervals and safety precautions. Keeping fields clean of overripe and rotten fruit will also help reduce the incidence of this insect. The trap body is made from a 16 ounce red plastic cup (we use Solo Brand P16RLR). You’ll need one that has a tight fitting lid (we use Solo Brand 626TS). Using a 1/8” hole punch (available through art suppliers), punch about 15 holes in a row around the cup just under the lip about 1/2” apart. Leave about 2” of the diameter of the rim with no holes so that liquid can be poured in and out. Punch a second row of holes just under the first row, to give you a total of 30, 1/8” holes. Use a black permanent marker to paint a 1/2” wide black strip around the cup under the rim, right over the holes you punched. To support the trap, cut a wooden tomato stake down to about 30”. Attach a 4” or larger hose clamp near the top of the stake to act as a cup holder for the trap. (We just punched a hole in the metal band of the hose clamp and attached it to the stake with a flat-headed wood screw.) Place the trap holder in a shady, moist place in or near the fruit planting, with the cup height about 18” off the ground. Fill the trap with 4 to 6 ounces of apple cider vinegar, water + sugar + yeast, or whatever bait you prefer. It is best to add a few drops of unscented soap to break the surface tension of the liquid. Place the lid on the cup to keep rain and critters from getting in, and place the trap in the holder. Adjust the hose clamp so that the trap fits in snugly but the trap holes are not covered up. Empty and re-bait the trap every week. Do not pour out the old bait on the ground near the trap, as this will draw flies away from it.